OOS (Occupational Overuse Syndrome) is often known as RSI (Repetition Strain Injury), and the term is misleading as it has been found that it is not necessarily the repetition or rapid movements that cause the condition. It is a prolonged and sustained muscle contraction that causes the problems. Recently updated in line with the new Health & Safety at Work Act 2015 OOS is regarded as a serious injury and is a notifiable event as far as WorkSafe NZ is concerned. 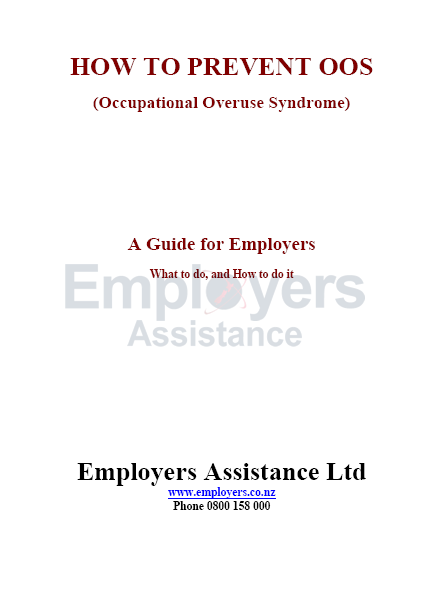 As an Employer or manager you need to know what to do when your staff begin to suffer from the effects of OOS and have an effective treatment and avoidance plan in place. This publication offers a detailed discussion on the topic and systems to put in place to deal with the issue in the workplace.